Chalkidiki Nea Plagia Flogita Beach is located next to the beach in Sozopoli, Central Halkidiki. 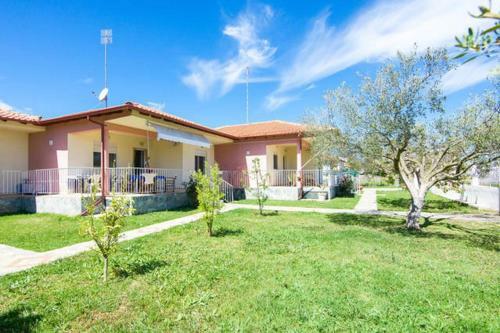 Chalkidiki Nea Plagia Flogita Beach common facilities include bbq	and garden. The property provides accommodation in family room, 2 bedroom apartment and other might be available upon request. The rooms offer sea view, landmark view, garden view and mountain view. Room amenities include a/c, heating, tv, satellite channels, fridge, etc. Free wireless internet is available in all areas of the hotel. At the hotel there is free parking. Pets are welcomed upon request and extra charged.